Chicago Tribune - 20 Best Wines under $20.00! Bill St. John is a columinist for the Chicago Tribune. He has been writing and teaching about wine for over 40 years. We are honored that our 2011 Marsanne (only two US white wines received this honor) has recently been listed in his article "20 wines under $20.00", below is an excert from the article. Click here to read the entire article. In a broad sweep, there are wines from several winemaking regions. I list the nine white wines first, then 11 reds, everything by vintage. In the U.S., every wine sells for $20 a bottle or less; however, prices do vary by state. Anything generally less than $15 is so noted. I finish each wine note with something to eat. The complete location list can be found here on our website. Domaine Berrien Cellars is proud to announce the receipt of 2 gold medals, 3 silver medals, and 5 bronze medals for their wines entered in the 15th Annual Great Lakes Wine Judging, held in Farmington Hills, MI on May 20, 2010. The 2 gold medal winning wines are the Domaine Berrien Cellars 2008 Cabernet Sauvignon and the Domaine Berrien Cellars 2007 Lemberger. The 2008 Cabernet Sauvignon is only the second Cabernet Sauvignon that Wally Maurer, Domaine Berrien Cellars’ winemaker and owner, has produced as a single varietal. It has spicy black cherry and dark coffee notes with a smooth plum finish, nicely integrated oak, and a smooth finish. This is a wine with great longevity - one to put away in your cellar. The 2007 Lemberger has rich, toasty overtones. It is slightly spicy, with a dry finish, dark ruby-red color, with cherries & spice on the nose and palate. Both gold medal winning wines are available for tasting at Domaine Berrien Cellars’ tasting room daily from Noon to 5 PM. Winning silver medals were the Domaine Berrien Cellars 2007 Cabernet Franc, the Domaine Berrien Cellars 2007 Syrah, and the Domaine Berrien Cellars 2009 Traminette Dry. The Domaine Berrien Cellars 2008 Merlot, the Domaine Berrien Cellars 2009 Sauvignon Blanc, the Domaine Berrien Cellars 2009 St. Vincent, the Domaine Berrien Cellars 2009 Red Satin, and the Domaine Berrien Cellars 2009 White Satin were each awarded a bronze medal. Domaine Berrien Cellars is located in Berrien County, Michigan, in the Lake Michigan Shore Viticultural Area (AVA), and produces all estate wines. Set on an 80-acre farm, Domaine Berrien is a family operation, with 37 acres currently planted in wine grapes and 8 acres planted in juice grapes. Opened in 2001, the winery offers a quaint tasting room overlooking the wine production facility. Domaine Berrien Cellars was recently honored at the Annual Berrien County Farm Bureau Dinner for their "Proactive Leadership in Ecology Management." Domaine Berrien was the first winery in Southwest Michigan to become verified by the Michigan Agriculture Environmental Assurance Program (MAEAP) for their environmental sustainability. The winery received this honor for their leadership in practicing sound environmental farm management in land, water, fertilizer and pesticide use. The Annual Berrien County Farm Bureau dinner was held November 4, 2010 at Pebblewood Country Club in Bridgman, MI. 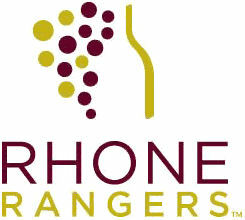 Domaine Berrien Cellars is proud to announce the release of the first Syrah commercially grown and vinified in Michigan. One of Michigan’s newest wineries, Domaine Berrien Cellars is located between Baroda and Berrien Springs, in the Lake Michigan Shore Viticultural Area (AVA), and produces all estate wines. Harvested by hand in September, 2002, and aged for 12 months in French oak barrels, Domaine Berrien Cellars’ 2002 Syrah is made in the traditional burgundy style, with complex spicy overtones and dark berry flavors. Available for sale only at the winery tasting room, there is a limit on the Syrah of 2 bottles per customer. Planted starting in 1999, the syrah grapevines have successfully withstood southwest Michigan’s winter weather to date. The 2003 Syrah is currently barrel aging for a May, 2005 release. Domaine Berrien Cellars, founded in 2001, produces 8 red wines and 7 white wines, concentrating on northern Rhone varietals (such as Viognier, Marsanne, and Syrah) and other classic northern European varietals (such as Cabernet Franc, Pinot Noir, and Merlot). Set on an 80-acre fruit farm, Domaine Berrien is a family operation, with 18.5 acres currently planted in wine grapes, 8 acres planted in juice grapes, and 24 acres planted in tart cherries. For more information, contact the winemaker, Wally Maurer, at (269) 473-9463 (WINE). 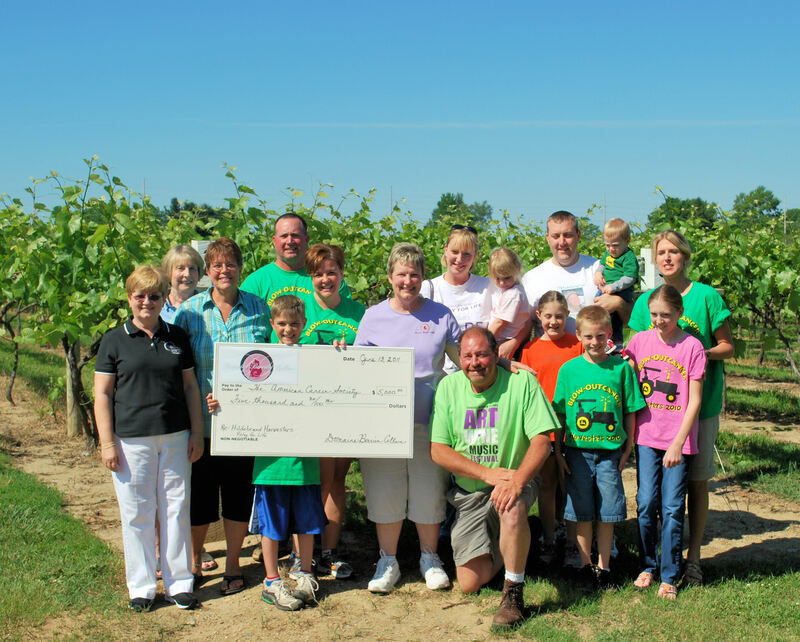 Domaine Berrien is please to announce that they are donating $5,000 to the American Cancer Society through the Hildebrand Harvesters Relay for Life team. This is being done in loving memory of Wally's mother, Kathleen (Kathy) Maurer who succumbed to breast cancer after a 3 year battle. Wally and Katie set aside $1.00 from every bottle of Cabernet Franc wine sold. 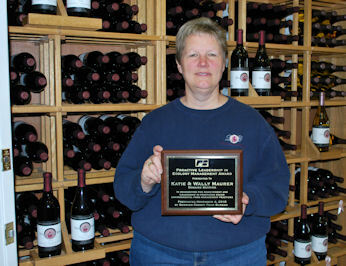 Cab Franc was Kathy's favorite wine and they are proud to honor her memory in this small way. This is an on-going donation that applies to all Domaine Berrien Cellars Cabernet Franc sales year round. The American Cancer Society Relay for Life is a life changing event that gives everyone in communities across the globe a chance to celebrate the lives of people who have battled cancer, remember loved ones lost, and fight back againsn't the disease. The Hildebrand Harvesters Relay for Life team was formed in 2005 to keep alive the memory of local farmer, Mark Hildebrand. Mark was a lifelong resident of Berrien Springs who died at age 29 from colon cancer. Domaine Berrien wine featured at Chicago restaurant!